Couple weeks ago, I reviewed the third book in Lisa Lutz‘s series about a family of private investigators, Revenge of the Spellmans. 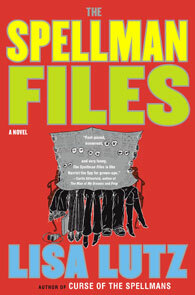 Now Variety reports that the movie of the first book, The Spellman Files, is moving forward with Barry Sonnenfeld at the helm. Sonnenfeld has done everything from directing the two Men in Black movies (Sony just confirmed a third installment) to producing Pushing Daisies and The Tick on TV so this could be wild! If you’ve read the book, who do you envision as Izzy? I would love to see Emily Blunt in the role. She’s about the right age and her impeccable comic timing would do Izzy justice. And how about Rae and David and Olivia and Al? Post dream cast ideas in the comments! Dang! Now I really have to read it. Wow, that’s pretty cool they got Barry!